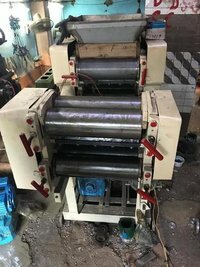 Send Inquiry Fried Instant Noodle Making MachineZHENGZHOU KINGDOO MACHINERY CO., LTD.
Used in the manufacture of high quality papads, the Auto Papad Making Machine that we offer are preferred for their high production capacity and superior build quality. Spares for the machine are readily available in the market at cost effective prices owing to which the machine is easy to maintain. Speed Spiral Mixer We are involve in offering superior quality Speed Spiral Mixer. These Speed Spiral Mixer are made from high quality of raw material which ensure durability at its us...We are involve in offering superior quality Speed Spiral Mixer. These Speed Spiral Mixer are made from high quality of raw material which ensure durability at its user end. These products are available in market at most economical rates. 5YR DHAN FOOD EQUIPMENT PVT. LTD.